Price isn’t everything, but it’s something when it comes to effects pedals. After all, we can’t put something on our board unless we can afford it. In the world of boutique pedals prices can often be outside the range of the common 9 to 5’er who has other obligations and bills to pay. Building a board can take years for even the most dedicated gear hound – you know the one. They eat only Ramen and ketchup for a month, start riding their bike to work to cut down on gas costs and use newspaper to save on the cost of TP – all in an effort to pull that boutique stomp off the shelf of the local pawn. All in all, fantastic boutique effects pedals are relatively cheap compared to the quality and utility you can pull out of them. Honestly, many of these boxes are just as much art as they are effects. Hand wired, screen printed, assembled with love by obsessed, spirited, crazed artisans chasing tones down the rabbit hole of their imagination. We live in a glorious time where a never-ending cadence of new, inventive circuits burst out onto the market place with regularity. But, even a masterfully built effect at $199 can still be out of the reach of those of us squeezing out a living at $10 an hour. For those of us shallower pocketed musicians with GAS, we must search out the darker regions of the internet where quality and utility give way to efficiency and affordability. This doesn’t mean that these effects are completely devoid of quality and utility. It just means that they are sharing their seats on the plane in order to make the trip more affordable. Bulk parts from bulk buyers, machine soldered, stamped and assembled. Coldly constructed and put out to market to serve the masses. Such is the case with a pedal that someone made me aware of today. It’s the Monoprice Distortion Pedal and it costs…..wait for it…..$18.50. Yes, for under $20 you can purchase a distortion circuit. Honestly, you couldn’t even purchase the parts for a distortion effect (with the case and color) for that price, much less have it assembled. Only through the bulk purchasing of components and very, very inexpensive labor can such a feat be accomplished. I’m going to make a wild guess and says that this may be the most affordable stomp box (new) I’ve ever seen. Before I go on further I want to say that I’m excited the Monoprice line of pedals exists – yes, they make more and they are all affordable. I’m excited they exist, because they are giving financially destitute musicians the opportunity to wash their sound with effects. I have no idea what it sounds like, but we all know that fuzz and distortion circuits aren’t rocket science. It probably does the job, pushes out the rumble and crunch and will bring a smile to any musician who considers a night out at the Sizzler a fancy meal. So today we’d like to hear about everyone’s first pedal here at Pedal Finder. Was it affordable? Was it new or used? What other pedals out there come at a low entry price that we all need to know about. Speak up and let us know. 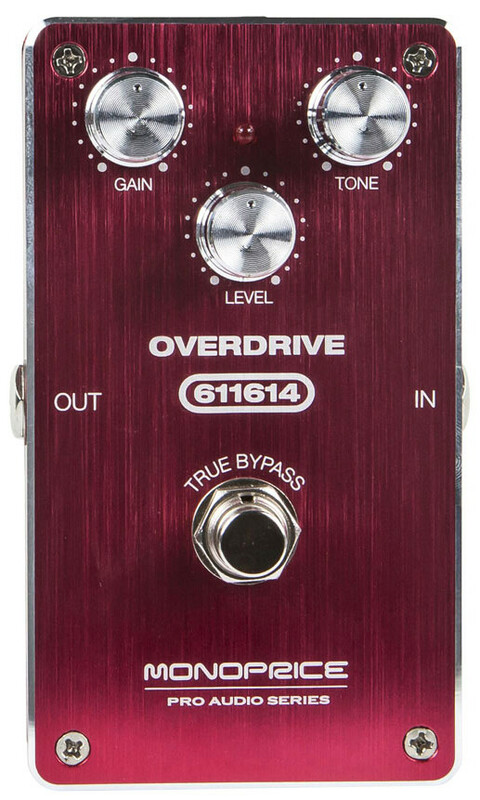 Seems like its a Tube Screamer clone. 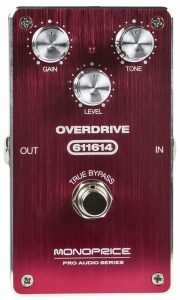 Its also cool that they also have a Programmable 4-Loop Pedal Switcher for $80…those things are usually quite expensive. Danelectro had a few stompbox lines that were inexpensive. I’m old enough to say my first pedal was a Big Muff that cost $35 (new). Back then, I was making $12/hr, which was fine money for a part time job in the late 1970s. That Muff died after a few years, otherwise I’m sure I could get my investment back with interest now. I love when pedal boards are very minimal, allowing the musician to just jump up on stage and wail. The greatest musicians can make any guitar through any amp, and hardly any effects pedals, sound great. I just started playing 18 months ago. My first pedal came 6 months later, a boss sd1 with the Wampler Fat and bypass mods for $45. One catch. It was always on. The switch does not work. And I love that pedal. It has so influenced whatever sound I may possess. I’m in love with a few pedals from Joyo, specifically Vintage Overdrive (TS clone), and their Tremolo. Super2 affordable, and has great sound to it. It’s made in China, which explains why the pricing is low. Overall it is nicely build, although I wouldn’t call it super rugged. Had mine for almost a year now and super happy with it!